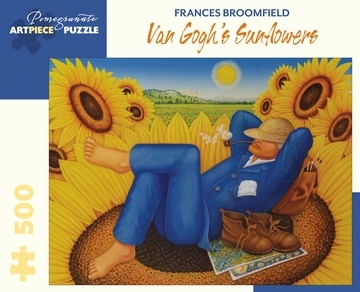 Take a break amid the mighty sunflowers Vincent van Gogh famously adored. This peaceful moment, imagined by artist Frances Broomfield, evokes the impressionist’s old painting grounds in the south of France. Broomfield is attracted to the eccentric in her art, creating paintings often tinged with mystery and humor. She studied fine art painting at university, and her work is in collections in the Warrington Museum and Art Gallery and the Glasgow Museums.